NOTE: This page is a compilation of important articles about the impact of backpack stress on children. I don't have copies of these articles to mail you. If you want a copy of one, you'll need to contact your library. If you want to reproduce these materials, you will need to contact the authors or publishers (the copyright holders) for permission. We can NOT grant that to you. Over 70% of the subjects had a schoolbag that exceeded the recommended 10% bag weight to body ratio. A total of 32% of the sample complained of back pain, with 74% of these defining it as low in intensity on the face pain scale-revised. The presence of back pain was statistically related to gender, body mass index (BMI), school and bag weight to body weight ratio. After adjusting for other factors, self-reported back pain in schoolchildren is independently linked to carrying heavy schoolbags. This link should be addressed to decrease the occurrence of back pain in this age group. This small trial explored whether using an airport-luggage style trolly might reduce spinal stress in school children. What might work at the airport for Mom does not seem to work so well for Junior, lugging their schoolbooks along uneven sidewalks on the way to school. The authors had to conclude: “This suggests that school children should use backpacks rather than trolleys when the weight is within recommended limits”. Loss of balance is among the primary causes of unintentional falls and postural sway represents an effective indicator of balance abilities. In this study, sway parameters were assessed in primary school children wearing backpacks. The differences that were observed show that backpack carriage potentially increases the risk of falls. Carrying a backpack weighing 15% of body weight changes all the postural angles in preadolescent children. Five hundred and thirty-one 5th– to 12th–grade Northern California students and their backpacks were weighed. Students were individually interviewed about how often they experienced pain while carrying a backpack, the site of their pain, and if the pain had interfered with school activities or led to medical care. Greater relative backpack weight is associated with upper- and mid-back pain reports but not neck or lower back pain; it is also associated with lost school time, lost school sports time, and greater chiropractic utilization. Musculoskeletal symptoms were reported by 77.1% of the students. Symptoms were most prevalent in the neck, shoulders, upper back and lower back. Although musculoskeletal symptoms are believed to be multifactorial in origin, the carriage of heavy schoolbags is a suspected contributory factor and may represent an overlooked daily physical stress for New Zealand secondary school students. In a sample of 3,498 students living in two counties in California, each student's weight and backpack load were measured. Demographic information as well as information about backpack use was obtained. Nonspecific mechanical back pain was found to be highly prevalent, and the reported severity and chronicity of pain were high. Controlling for age, socioeconomic status, walking to and from school, and method of wear, results indicated that backpack weight, measured as a percentage of body weight, was effective in predicting back pain (P < 0.01). Of 1122 backpack users, 74.4% were classified as having back pain, validated by significantly poorer general health, more limited physical functioning, and more bodily pain. As compared with no or low use of backpacks at school, heavy use (odds ratio, 1.98; P < 0.0001) wasindependently associated with back pain. Female gender and larger body mass index also were significantly associated with back pain. For many students, "hitting the books" leads to academic achievement. Students who carry those books in overloaded backpacks may be unknowingly participating in the beginning of a health epidemic. Scientific research reveals an alarming danger associated with improper childhood backpack use. This research stems from the increasing number of reports of childhood back pain in recent decades. The Congress of Chiropractic State Associations (COCSA) will initiate a "National Backpack Safety Month" in April to promote backpack safety. This program aims to educate students, parents and teachers about injuries caused by the ubiquitous, heavy backpacks kids tote to school every day, and how to prevent those injuries. The aims of this pilot study were to determine whether the weight of a backpack, its position on the spine or time carried affected adolescents cervical and shoulder posture. Standing posture measured from the sagittal and frontal planes of 13 students was recorded photographically under several load carrying conditions. Cervical and shoulder position angles were calculated and compared. Results revealed that both backpack weight and time carried influenced cervical and shoulder posture. Forward Head Posture increased when carrying a backpack, especially one with a heavy load. 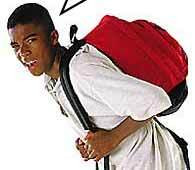 Carrying a backpack weighing 13% of body weight appeared to be too heavy to maintain standing posture for adolescents. These findings have implications for future load carrying studies in adolescents. Back pain is pervasive in our society. Eighty percent of all Americans will suffer from it at some point in their lives, and 50 percent of us will suffer from low-back pain this year alone. Low-back pain is the most common health problem experienced by working Americans today, and a condition which costs our nation’s economy at least $50 billion a year in lost wages and productivity. Much of this suffering is brought on by bad habits initiated during our younger years – such as carrying overweight backpacks to school. The improper use of backpacks can lead to muscle imbalance that could turn into chronic back and neck problems later in life. Chiropractors have long recognized the spinal health hazards of heavy backpack use. Now, research presented at the American Academy of Physical Medicine and Rehabilitation's annual meeting exposes yet another potential danger of heavy backpacks: They promote falls in students who wear them. Students carrying more than 10 percent of their body weight are susceptible to lower-back and spinal pain, with female students more susceptible than males and younger students more prone to injury, according to a study by the University of South Australia. NEW YORK – Back to school should not signal the start of aches and pains, but for many youth who use back packs, it could be full of visits to the physician's office. Doctors of chiropractic have long emphasized the importance of posture and other lifestyle factors in the body's ability to function optimally. In a broad sense, good posture can be considered an ongoing battle against bad habits. Alexa Sloan, a slim 16–year-old, carries her world in a backpack. Slung fashionably over her shoulder, it contains several textbooks, her notebooks, day planner, lunch, posters and school projects such as the 3–D model of a cell membrane that she created for biology class. Sloan, a sophomore at Walt Whitman High School in Bethesda, Maryland, typically carries 25 to 30 pounds in her black one-strap backpack. Too heavy, she knows, but she's reluctant to forego the convenience offered by her backpack. "I have shoulder pains. There's a sore, pulling feeling and I worry about my spine being bent over all crooked under the weight," she says. "But I dont really have a choice. Theres not enough time between classes to go to my locker." As academic requirements are raised up, so are the amounts of books students are carrying to and from school. Parents, school officials and health care providers have growing concerns with the increased amount of weight being carried each day. According to a recent news article, the issue has taken on serious implications and pediatricians have said that school children should not carry more than 10 % of their own body weight. Dr. Wayne Yankus, of the American Academy of Pediatrics says, "There is a growing concern that youngsters may have long term back problems from trudging about with such heavy loads." A skinny 10–year-old boy, all 75 pounds of him, lurches lopsidedly down the street, a 30–pound backpack over one shoulder. A small girl bends to tie her shoe; her bulging backpack overwhelms her balance, and down she goes. What kids are carrying to school these days can add up to a percentage of body weight–20, 30, even 40 percent–that would stagger an adult. Schools are hearing from concerned parents. Chiropractors and orthopedists say pain and soreness resulting from heavy backpacks are sending more children into their offices. This article is no longer available on their website. An Academy survey of 101 physicians disclosed that 58 percent had seen school-age patients complaining of back and shoulder pain caused by heavy backpacks. "If you have an 90–pound female carrying a 20–pound backpack, then the backpack weight becomes a medical issue," Dr. Alexander said. "Most of the students surveyed are carrying backpacks weighing more than 10 percent of their body weight," Dr. Alexander said. "We found one 10–year old female student with a backpack weighing 47 pounds." 34.8% of Italian schoolchildren carry more than 30% of their bodyweight at least once a week, exceeding limits proposed for adults. Given increasing evidence of back pain in children, the time has come to propose some limitations to backpack load. A significant change in craniovertebral angle was found at every year level, when comparing standing posture with no backpack with posture when carrying a backpack. The change was greatest for the youngest students. Using a Vicon 140 3-D system we measured the effective mobility of the different spinal segments in the sagittal plane during one step. For every subject, we noticed a significant decrease of the effective inter-segmental mobility (EISM) between S1–L3–T12 (p < .01) while backpacking a 22.5 kg load. Rich Pistolese, (former) research director of the ICPA, draws our attention to the risks associated with backpacks. This article, written well before it's publication in late 1998, is most likely the first chiropractic article on the subject. Nice going, Rich! Subjects were filmed, with and without backpacks and gym bags, and observed for lateral spinal deviation, shoulder elevation, stride length/frequency and anteriority of head and trunk, and found that carrying book bags on one shoulder significantly alters the posture and gait of youthful students. Is the back a good place to carry books? Yes. The vast majority of students in elementary school, high school, and on college campuses opt for backpacks, as opposed to hand-held book bags. It is not only a fashion statement, but a logical choice for a way to carry a heavy load.